Jay Phillips understands the value of faith-based programs for inmates. 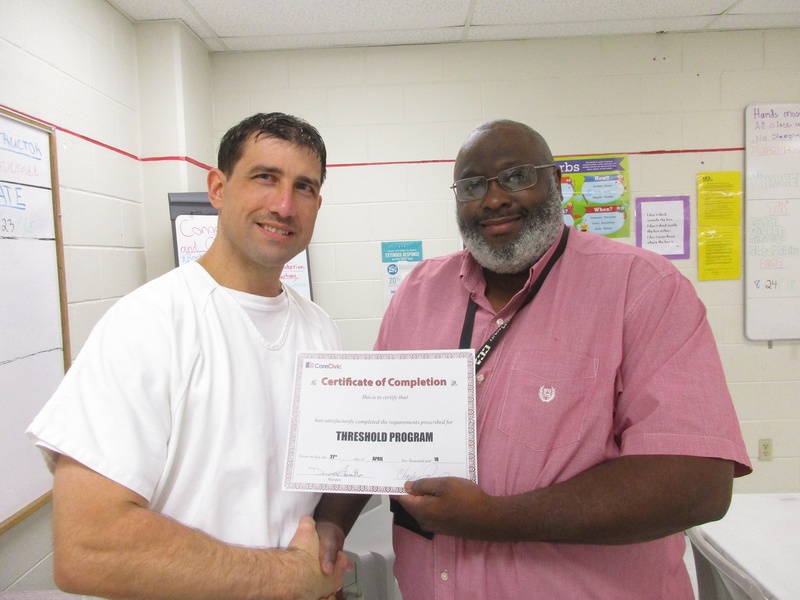 As program facilitator at Wheeler Correctional Facility, he has witnessed firsthand the positive impact of one such program, known as Threshold. It originated with the Federal Bureau of Prisons, one of CoreCivic's longstanding government partners. Last year, thanks to a collaboration with the BOP, Wheeler became the first CoreCivic facility to adopt the program. Threshold gives interested individuals an opportunity to explore their spirituality, and it accommodates a broad range of religious and secular perspectives. The 26-week program teaches participants how to cultivate positive relationships with themselves and others, while improving their decision-making. "Threshold allows inmates to reflect on who they really are, while showing them who they can become," Phillips said. "The program's reassuring atmosphere helps participants approach life issues without fear of judgment." Threshold facilitators come from a variety of faith backgrounds – they are both CoreCivic employees and trained volunteers from local civic organizations and houses of worship. Twice each week, facilitators meet with about 15 participants. During the two-hour sessions, inmates practice techniques like journaling, self-reflection, group processing, and individual studies to work toward relational healing. Participants also build necessary life skills, such as managing grief and anger. Since CoreCivic adopted Threshold in 2017, more than 1,200 inmates have completed the program, while many voluntarily remain on a waitlist to participate. "More than 1,050 inmates are currently enrolled in Threshold, and we hope to continue increasing our average daily enrollment," said Tim O'Dell, CoreCivic director of Chaplaincy and Volunteer Services. "Our goal is to equip these individuals with the tools needed to thrive in their communities after release." Wesley P., a Threshold graduate at Wheeler, is a living example of the program's impact. He has already mapped his route to successful reentry. "Because of Threshold, I have regained my self-confidence," Wesley said. "Now I see why it's important to respect myself, as well as the values of others. When I return home, I want to help restore hope to the people in my community so they, too, can build a better future." After his release in 2020, Wesley plans to further his education and become an addictions treatment counselor. His success story is just one of many, largely due to the efforts of Threshold facilitators like Philips. "I take pride in my job because I get to help these individuals restore their dignity," he said. Threshold is now available at 16 CoreCivic Safety facilities in seven states. Plans are in place to launch the program at even more facilities in the coming months. Research shows that faith-based programs are a key part of the reentry process. One Baylor University study found that graduates of a faith-based program are significantly less likely to be arrested or incarcerated during the two-year period following release from prison. Along with Threshold, CoreCivic currently offers 13 other faith-based programs. Each program is designed to help participants grow personally and spiritually, and foster positive connections to the community. In 2015 and 2016, 3,482 inmates at CoreCivic facilities voluntarily enrolled in faith-based programs with a 95 percent completion rate.